King Arthur's Arms InnFamily pub, located on the main street of Tintagel. The bar benefits from a real fire, baby changing and disabled facilities, comfortable seating, pool table and darts. The adjacent patio areas are on the front and side aspects of the pub providing a sunny aspect that is easily accessible. 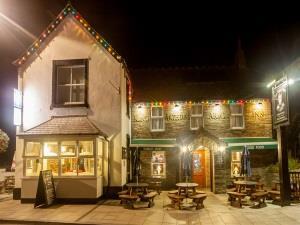 There is a choice of real ales, soft drinks and homemade food which is served all day. Free to use high speed Wi-Fi is provided via BT. We also have a free to use ATM machine for your convenience. The rooms are comfortable with either en-suite or dedicated shower rooms. All rooms have (or are normally available) hairdryer, cot, safe TV, tea making facilities and iron / ironing board. B&B rates include full English breakfast and parking pass for adjacent car park. The kitchen is open all day (normally 9am to 9pm) for evening meals, cream teas, morning coffee, afternoon teas or just a snack. In common with all buildings in the UK, the pub is now totally smoke-free. An outdoor shelter will be provided for anyone who wishes to continue to smoke. The ease of parking and location on the north Cornwall coast make it an ideal location for stop-overs or longer stays to tour the area and enjoy leisure activities, coastal footpath, local golf course, beaches and the famous King Arthur's Castle with Merlin's Cave. FREE PARKING in adjacent car park (via pass available from the bar). King Arthur's Arms sometimes limits bookings to 3 or more days. One double bed and one 3 foot single bed. Cot & high chair available. Iron, ironing board, shoe cleaner,tooth brush/paste, shaving essentials available, please ask. Window seat, Flat screen TV, tea/coffee making facilities, safe, hairdryer, shampoo, soap, showercap. private shower room. VIP Parking pass to adjacent car park whilst a guest at King Arthur's Arms. Overlooks National Trust Old Post Office. One double bed and two 3 foot single beds. Cot & high chair available. Flat screen TV with free view, small settee, two windows, safe, wardrobe, hair dryer, shampoo, soap, showercap and tea/cofffee making facilities. Iron, ironing board, shoe cleaner, shaving essentials, tooth brush/paste available please ask. VIP Parking pass for adjacent car park whilst a guest at King Arthur' Arms. Room 1 (family) sometimes limits bookings to 2 or more days. Suite Sleep 6 sometimes limits bookings to 2 or more days. From Tintagel Visitor Centre car park, turn left and drive over the mini roundabout. 100 yards to the right you will see King Arthurs car park. Park here. The pub is adjacent, opposite the Old Post Office. Special Diets can be catered for from our existing menu. Prior notice would be required for some.